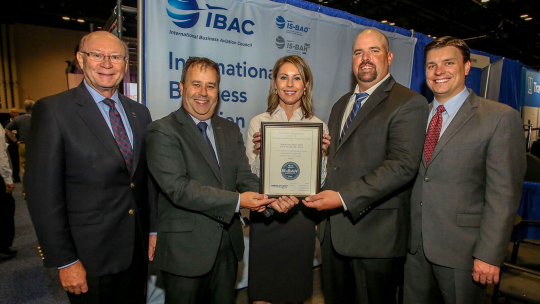 IBAC’s International Standard for Business Aircraft Handling (IS-BAH™) registration is a global, voluntary code of best practices for business aviation ground handlers. It incorporates a safety management system (SMS) in all aspects of FBO operations and is aligned with the International Standard for Business Aircraft Operations (IS-BAO). In 2015, American Aero FTW was the first FBO in the Western Hemisphere to the earn IS-BAH Stage 1 registration. In 2017, the FBO was one of the first in the world to earn Stage 2. IS-BAH Stage 1 confirms that the SMS infrastructure is established and that safety management activities are appropriately targeted. Stage 2 ensures that safety risks are being effectively managed. Stage 3 verifies that safety management activities are fully integrated into an FBO’s business and that a positive safety culture is being sustained. Launched in July 2014, IS-BAH was established to provide standardization to handlers and operators around the world as they work to meet the coming SMS requirements from the International Civil Aviation Organization (ICAO). IS-BAH is a joint program between IBAC and the National Air Transportation Association (NATA). It incorporates the NATA Safety 1st ground audit program. To earn IS-BAH registration, an FBO must undergo a rigorous audit of its safety management systems, emergency procedures, organizational structure, administrative elements, security procedures, training protocols, and operating procedures. Certificates of registration are issued to FBOs that successfully demonstrate conformity to the industry’s best practice standards through completion of a multi-stage external audit by an IBAC-accredited auditor. American Aero FTW is recognized as the first FBO in the world to earn International Standard for Business Aircraft Handling (IS-BAH) Stage 3 safety registration during the opening day of the 2018 National Business Aviation Association (NBAA) Convention & Exhibition in Orlando, Florida. International Business Aviation Council (IBAC) and IS-BAH leaders were on hand to congratulate American Aero FTW representatives. Pictured L-R: Larry Fletcher, IBAC Audit Manager; Terry Yeomans, IS-BAH Program Director; Angela Thurmond, American Aero FTW Assistant General Manager; Heath Barnett, American Aero FTW Safety Officer; and Riggs Brown, American Aero FTW General Manager. IBAC represents the interests of business aviation worldwide. IBAC is a member-supported, non-profit international trade association with permanent observer status at the International Civil Aviation Organization, the UN Specialized Agency for aviation matters, in Montreal, Canada. IBAC promotes and manages the industry-leading standards for best safety practices through its IS-BAOTM and IS-BAHTM Programmes; Safety Management Tool Kit; SMS eLearning training; and Aircrew Identification Card. American Aero FTW is a private aviation terminal located at Meacham International Airport (KFTW) in Fort Worth, Texas. The fixed-base operator (FBO) is focused on the refueling, ground handling, servicing, and storing of business and private aviation aircraft and provides extensive crew and passenger amenities. In 2015, American Aero FTW became the first FBO in the Western Hemisphere to achieve the International Standard for Business Aircraft Handling (IS-BAH) from the International Business Aviation Council (IBAC), and it was one of the first in the world to earn Stage 2 registration in 2017. American Aero FTW offers 280,000 square feet of leasable hangar and office space and is the primary tenant and only FBO in the airport’s main administration building. American Aero FTW offers AvFuel Rewards and is a Signature Select™ affiliated FBO, providing Signature TailWins® points, Signature Status® benefits, and the benefits of the Signature Flight Support network. American Aero FTW ranked as the #1 FBO in Dallas/Fort Worth and among the top 5% of FBOs in the world in the 2018 AIN FBO Survey.